Versailles - European Tour 2017 | VKH Press – J-Rock & Visual Kei Coverage Worldwide! Just following the completion of Kamijo's solo performances in Paris, Versailles has announced a full European tour to begin early 2017! The resurrected band has only performed one full concert since their reunion, and this overseas tour will start and end before their next Japan date at Nippon Budokan, February 14th. 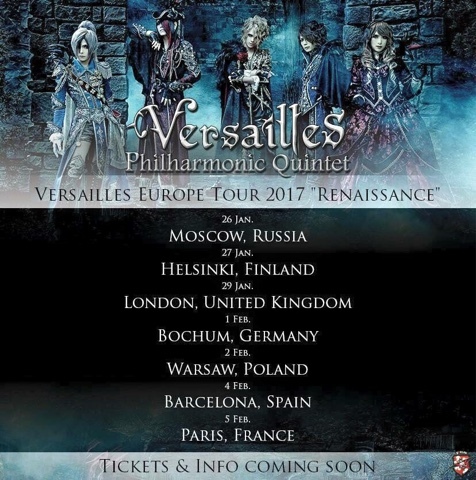 While so far only a European tour has been announced, Versailles and promotions company B7Klan have insinuated that this is simply the first of several announcements. If it's possible for you to make it to one of these European cities, to enjoy the return of this long-missed visual kei group, check the tour dates below and keep an eye out for more info as ticket sales are announced!